Computational studies into the nitrate anion, using molecular dynamics simulations and computational chemistry calculations. For the research part of my masters at Stockholm I studied reorientation of the nitrate anion in water. Using computational models we explained a remarkable broken symmetry in the anion’s vibrational modes. These theoretical studies are described in the following paper and thesis. Reorientation Dynamics of Nitrate in Water Thomas P Ogden Master’s Thesis, Stockholm University, 2011. 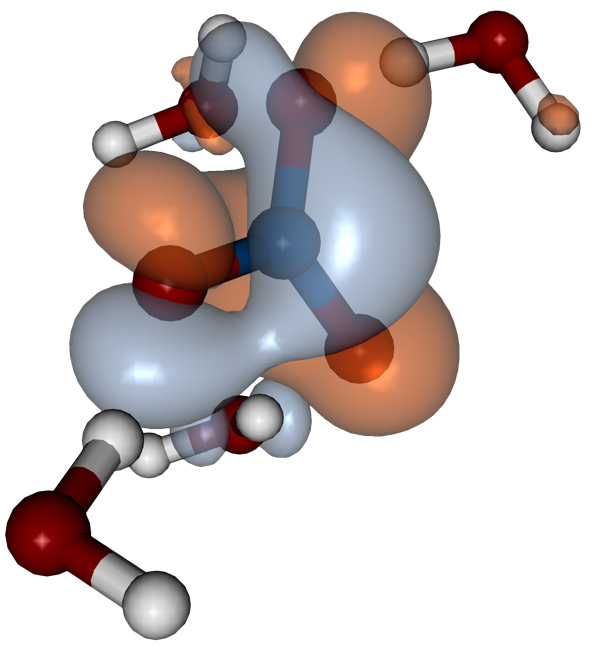 The following video shows the simulated dynamics of a nitrate anion within a hydration shell. For the video, the nitrate anion and a single hydration shell have been 'cut out' from the rest of the water atoms for clarity. The water molecules form hydrogen bonds with the nitrate, and the motion of the hydration shell jostles the nitrate. The frames are 50 femtoseconds apart, the whole video simulates ~50 picoseconds.